In this paper, Pseudomonas aeruginosa MTCC7815, a biosurfactant producing strain was studied for its ability to utilize waste cooking oil (WCO) as a sole carbon source for the production of biosurfactant. Culture conditions were optimized based on surface tension reduction and biomass concentration. The obtained biosurfactant was characterized using 1H NMR, FTIR, LC–MS, and MALDI-TOF techniques. The chemical properties of the produced biosurfactant were estimated by assessing the critical micelle concentration (CMC), emulsification index (E24) and oil displacement test. The optimal culture conditions were found to be similar to the natural domestic sewage such as basic pH value of 10, temperature of 25 °C and a very high WCO concentration of 40 gL−1 (C/N ratio of 40/1). The biosurfactant yield was found to be significant as 11 ± 0.2 gL−1 upon utilizing about 90% of WCO within 5 days of incubation. The biosurfactant produced was found to be a mixture of mono- and di-rhamnolipid in nature and comprised excellent surface active properties i.e. an extremely low CMC of 8.8 ± 0.3 mgL−1, E24 of 62.5 ± 0.3% and surface tension reduction up to 26.2 ± 0.5 mNm−1. 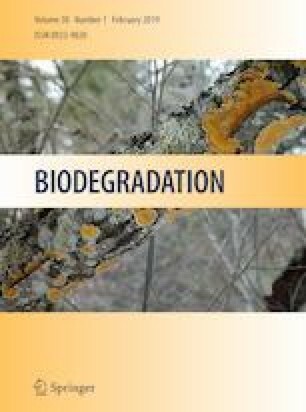 These results suggest the suitability of Pseudomonas aeruginosa for the biosurfactant production at commercial scale along with waste remediation in an economic way. The authors would like to thank the Department of Science and Technology, Government of India for financial assistance (Sanction nos: DST/INSPIRE/04/2014/002020, ECR/2016/001027) for this work. The authors would also like to acknowledge Central Instrument Facility (CIF), IIT Guwahati for allowing access to the MALDI-TOF, LC–MS, and NMR facilities that augment up to the work.